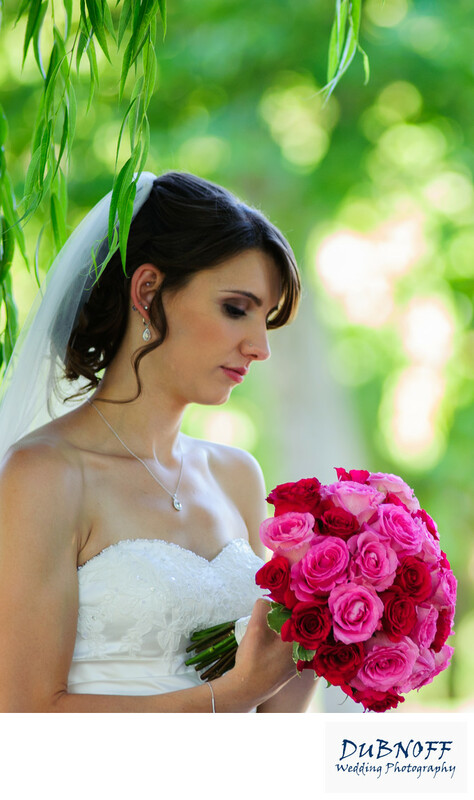 To make individual bridal portraits stand out, its important to use the proper camera lenses. For our bridal portraits we like to use longer focal length lenses which have the propensity to blur the background as you see in this wedding image. Another way to accomplish this is to shoot with a fast lens and open the F-Stop to its largest setting. On a typical portrait photography lens, this will also help blur the background and produce nice soft bokah. What is bokah you might ask? It is basically the appearance of a blurry background in a wedding photo. From the photo above you notice soft circles of various colors and the don't look too harsh. This is the type of background that wedding photographers cherish. Listed below are the various ways that a professional wedding photographer creates nice creamy bokah in their portraits.